Paolo’s father is an amateur jazz musician who still enjoys playing the double bass, banjo or harmonica, and Paolo has an older brother who plays the clarinet. So he grew up listening to a lot of classic jazz. At 16, he joined the Chicago-style Milano Jazz Gang. In 2000, he received his degree in music and piano from the G. Verdi Conservatory of Milan and then completed a five-year graduate program in economics for the arts, culture and media at Bocconi University, which is also located in his hometown of Milan, Italy. In 2004, he won a prize as the best young musician at the Breda Festival in The Netherlands, which led to the first of ten appearances at the Kobe Jazz Festival. It was at this point that it became obvious that Paolo’s future career would be as a professional jazz pianist. Musica Jazz magazine substantiated that decision, ranking him second in the “Best New Talent” category and first in “Brand New Jazz Acts” by popular vote for the 2007 Italian jazz awards. He was the recipient of a National Prize for the Arts in the jazz category by the Italian Ministry of University and Research. 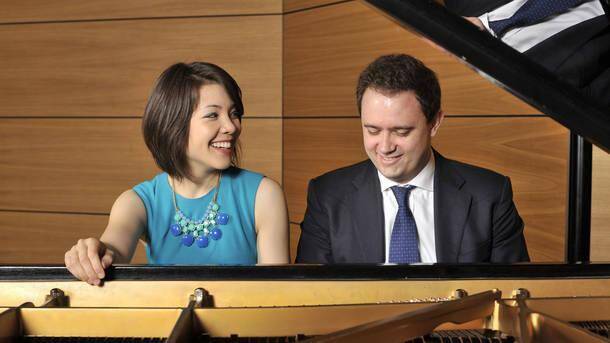 Paolo and Stephanie have been performing together for the past five years and have been married since 2013. They maintain an apartment in Milan and one in Stephanie’s hometown of St. Louis, where her mother still lives. They admit the travel is intense, spending half of their time in the United States, and half in Europe, a schedule that involves six or seven trans-Atlantic trips in the course of a year. This past September found them performing in Switzerland, Germany, France, and Sweden. This month they will be on a week-long jazz cruise up the East Coast from New York City to Nova Scotia along with a trip to the Sun Valley Jazz & Music Festival in Idaho. November, it’s back across the Atlantic to Switzerland and England and returning to the United States for the West Coast Ragtime and San Diego Thanksgiving Festivals. Wrap up 2016 with a 10-day jazz cruise departing from Miami, Florida for various ports in the Caribbean, and then heading for Asia for the International Music Festival in Thailand. Peripatetic has to be the operative word for this itinerant couple. Paolo’s first trip to the United States was in 2011 to perform at the Arbors Records Invitational Jazz Party in Clearwater Beach, Florida. He retains his Italian citizenship, but is considered a permanent resident of the United States as a Green Card holder. In what little spare time he has, he enjoys reading, especially about the history of America and its music. A highlight for Stephanie and Paolo was the opportunity to play for the Prince of Wales and Duchess of Cornwall (who are known as the Duke and Duchess of Rothesay in Scotland) at the Edinburgh Jazz & Blues Festival in 2014. While each has their own distinctive style, they have definitely found a basis for compatibility in the five years they have been together, whether it’s on one piano or two. Stephanie focuses on James P. Johnson, Fats Waller, and Albert Ammons, while Paolo leans more toward Erroll Garner, Earl “Fatha” Hines, and Teddy Wilson. The title of their first CD together in 2014 says it best: Two for One, along with demonstrating their great enthusiasm and passion for classic jazz.